Did you know that sailing across the ocean in a voyaging canoe isn’t just something Moana did in a Disney animated feature? And that some of Maui’s Wayfinding teachings are inspired by real-life Polynesian navigational techniques? Welcome to true stories of Hōkūleʻa – Hawaii’s voyaging canoe – as told by her crew, our real-life Moanas. Traditional wayfinding had gone extinct in Polynesia until Hōkūleʻa was built by the Polynesian Voyaging Society (PVS) in 1973. With hard work and sacrifice, Hōkūleʻa and her crew became the first to navigate across the seas as their ancestors did over 600 years ago, using only traditional wayfinding techniques. This was their latest achievement – a worldwide voyage. Hōkūleʻa just returned from this round-the-world voyage, sailing 40,300 nautical miles, visiting 23 countries and more than 150 ports of call. 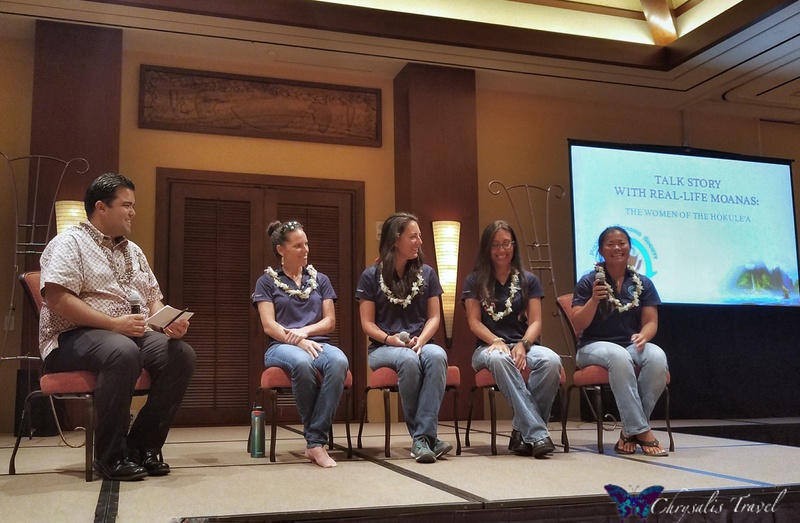 For an hour, we learned about what inspired these women to sail on Hōkūleʻa, how they prepared, what they accomplished in their journeys, and adventures along the way. Tamiko shared that she was from Okinawa, Japan. She was very concerned about the conditions of the reef there and joined the Coast Guard. When Hōkūleʻa arrived in Okinawa in 2007, Tamiko was inspired by the message of caring for the earth. “The Japanese people need this canoe.” She had to be a part of this movement. The mission of a worldwide voyage requires immense cooperation amongst the crew. Operations must flow like clockwork for the voyage to be successful. Personal issues cannot get in the way of survival out on the open seas. Each leg of the voyage is staffed with crew in different roles (kind of feels like Mission: Space). The crew described a great sense of collaboration. Hōkūleʻa is “where we are our best selves.” Crew members openly volunteered to help each other without being asked. Doing dishes may be a chore at home. But while at sea, there was ‘no better view than washing dishes at the back of canoe,’ said Lehua. These real-life Moanas explained that this three-year voyage was staffed by volunteers. Legs of the journey were divided into 4- to 6-week segments, after which there was a crew change. The canoe could carry 12 crew members at a time. Some crew members could afford longer or more frequent shifts onboard. 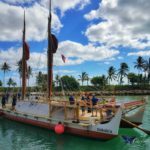 Overall, 245 crew contributed to the Mālama Honua worldwide voyage. The art of traditional Wayfinding had been lost in Polynesia. In 1980, master navigator Mau Piailug from Micronesia taught PVS president Nainoa Thompson the art of Wayfinding on Hōkūleʻa’s second voyage to Tahiti. Nainoa wants to make sure this knowledge is never lost again. On these voyages, the ladies described, there is one lead Navigator, and 2-3 assistant navigators. Lehua is an assistant navigator. She describes how being a navigator involves intensive academic and physical training. Learning the star charts, wave and wind patterns, and memorizing the ship’s position in the charted course. This is all mental training. Nainoa has written about the physical training involved. The crew does the physical work on the canoe, while the Navigator rests the body to focus the mind on navigating. Mau taught that the mind needs less rest than the body. When the mind needs rest, the navigator takes catnaps to revive the mind, then goes back to work. Becoming a crew member on Hōkūleʻa is a highly competitive process, say our speakers. After logging many hours of volunteer ancillary support work, you still need to pass certain physical tests. Since everything is manual on the ship, a minimum level of physical fitness is required from each crew member. Crew members must pass a 1-mile swim test, and a 1-mile running test. Significant upper body strength is required since often you will need to hold on just to keep from falling overboard at sea. 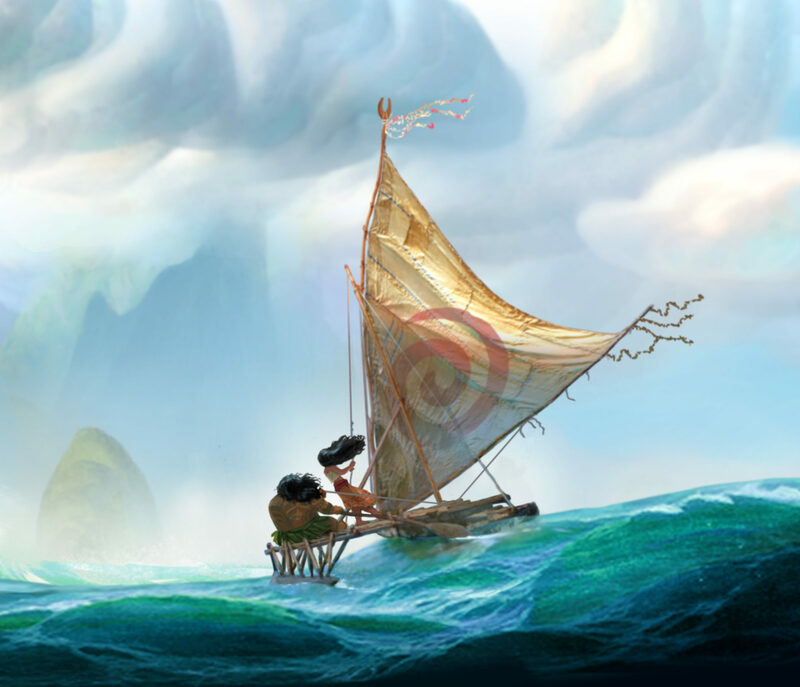 Remember how Moana needed to tie down her sails and change course using her paddle? All upper body strength. Are women at a disadvantage becoming crew members on a voyaging canoe? Our panelists reflected. Traditionally, men had the primary role on the ocean, as they were fishermen. Women’s role was on the land – caring for children and the home. Interacting with people around the world, many don’t understand the concept of a voyaging canoe. They may think more along the lines of a kayak. Lehua was proud that Moana is a strong female navigator. 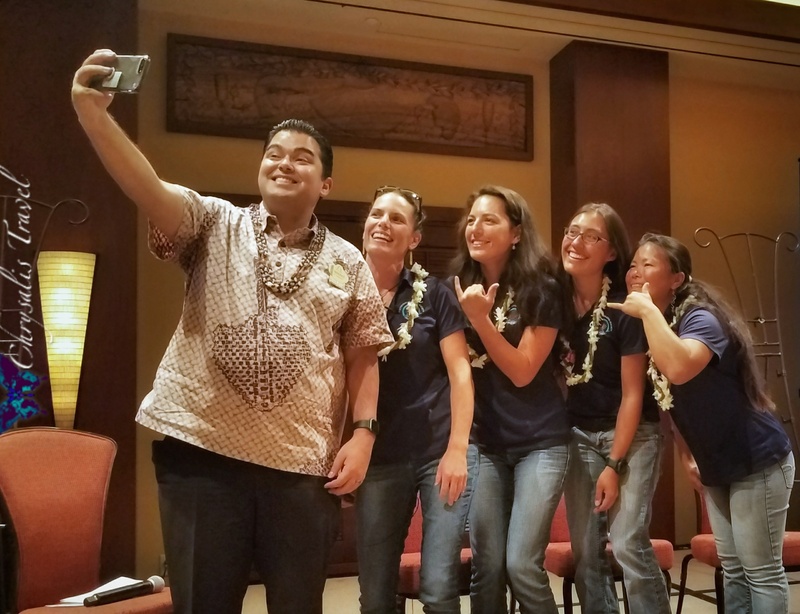 In charting the course for the Mālama Honua worldwide voyage, Navigators studied ‘all countries touching the oceans,’ and took into account risky political situations in these countries. There is also a threat from pirates at sea. Navigators plan carefully to steer their charted course away from reported pirate activity. Due to the small size of the canoe, weather and sea conditions are important factors in safety. Our crew shared a story of how sea conditions suddenly turned poor in Madagascar, and Hōkūleʻa missed this port. 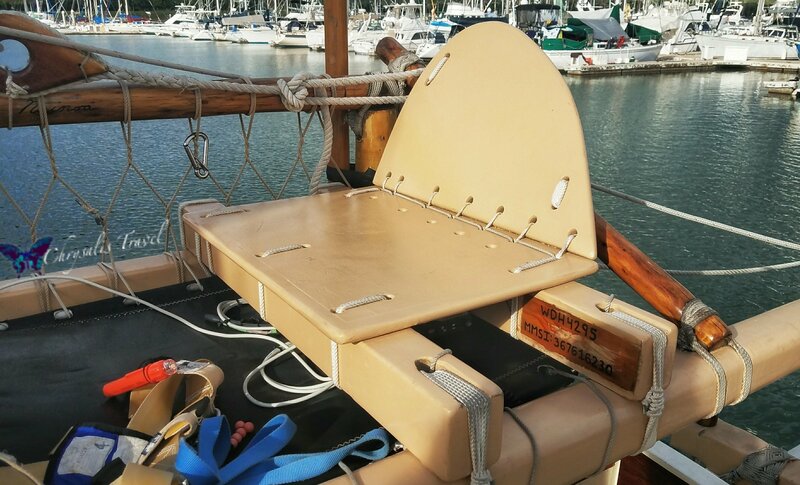 Sailing on, she drifted across the Indian Ocean and made unexpected landfall in Mozambique. Natives were surprised that these courageous sailors had crossed the ocean in this little canoe. I can see them thinking: “You came in that thing? You’re braver than I thought!” The crew bonded with locals, who loved Hawaiian pizza. Tamiko’s role is the chef. She described planning 7 days of unique menus. Meals would alternate between items such as chicken long rice, curry, fresh fish… even steamed cake. After seven days, the menu would repeat. 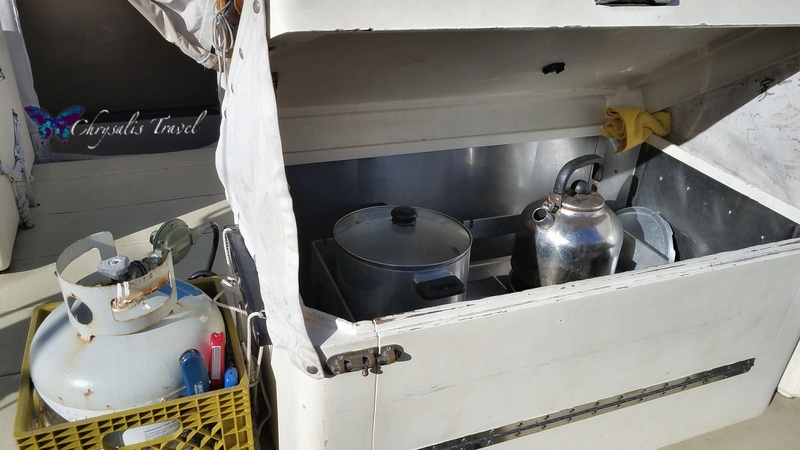 She worked miracles with the little galley onboard! Crew members reflected on a strength of Hōkūleʻa’s mission: building up a positive network of hope. Noelani described one of the most inspirational moments on her voyage. While sailing across Florida in canals near lake Okochobee, Hōkūleʻa stopped at Indian Harbor, Florida. The locals showed such extraordinary hospitality, the crew were overwhelmed by their incredible impromptu welcome. The canoe’s arrival brought together the entire community. Locals opened up their homes and fed them like family. Noelani still remembers “Diego’s tacos” with a smile. Ka’iulani and Noelani are teachers at home. Crew members are encouraged to adopt a school so that the knowledge they gain will not just remain with them, but be shared with others. 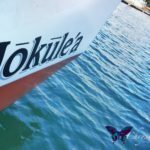 The crew of “Mālama Honua” voyaged with a message of stewardship and living well on island Earth. Teaching themes include that of conservation – managing natural resources with sustainable living. An emphasis is also placed on the science and technology track – math, astronomy, oceanography, geology, and marine biology. 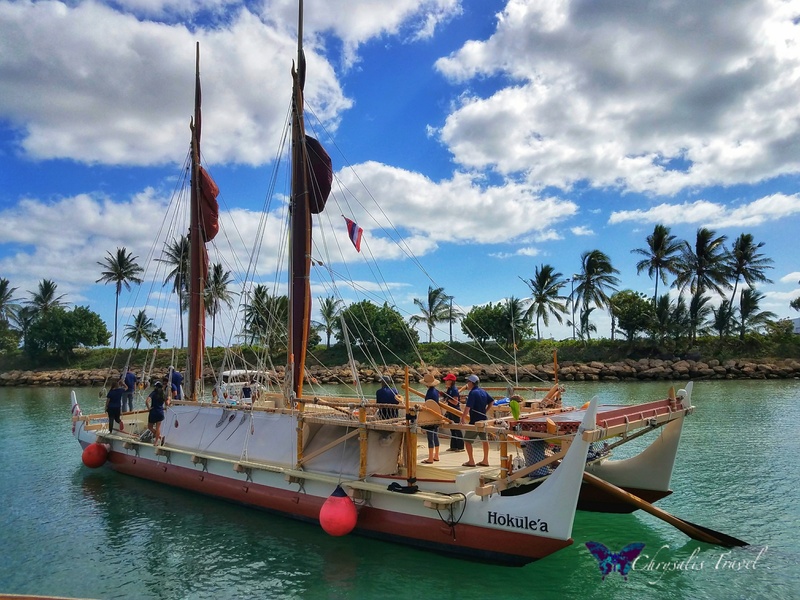 You can find more teaching guides on the Hōkūleʻa website, including a “Sail On Moana” song kit. Around the world, the crew aimed to build a global community, sharing the culture and common ancestry of Pacific Island nations. School children and the community were welcomed to visit, to touch, to learn the history of this legendary canoe. After sailing 140,000 nautical miles around the world, what is next for Hōkūleʻa? There are so many more countries the crew would like to visit, to share their message of hope and global community.